Alpine Meadows Ski Resort on the beautiful North Shore of Lake Tahoe California has been a favorite of Tahoe locals for decades. With 2400 acres of skiable terrain and one of the longest skiing and boarding seasons in Lake Tahoe, it's no wonder people of all abilities flock to this winter retreat. In addition to Alpine Meadows Resort, the selection of Lake Tahoe skiing and snowboarding in this mountain paradise is hard to match. The area boasts are over 20 ski areas to fit all types of skiers and snowboarders. On the South Shore of Lake Tahoe you'll find the legendary slopes of Heavenly Ski Resort just steps from the nightlife and casinos that only South Lake Tahoe can offer. Whether you like the speed and exhilaration of downhill skiing and snowboarding or the peacefulness of cross country skiing, Lake Tahoe has it all. For more information, including ski resort reviews, snow reports and web cams, check out Ski Tahoe's Guide to Lake Tahoe Skiing. If you're looking for vacation rentals for your ski or snowboarding trip, you can browse 1000's of Lake Tahoe vacation rentals, at Lake Tahoe .com or search a directory of Lake Tahoe hotels and motels to find the perfect slopeside lodging. After a day on the slopes, you'll want to take advantage of all the other wonderful activities Lake Tahoe has to offer, both indoors and out. Visit Lake Tahoe events for a full calendar of all upcoming events. And please don't forget our world-class dining, gambling and casino nightlife. 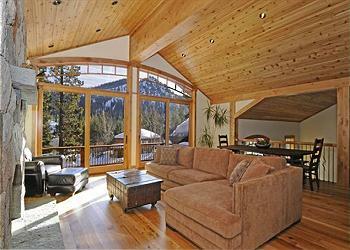 Check Lake Tahoe Lodging availablity and make reservations online.